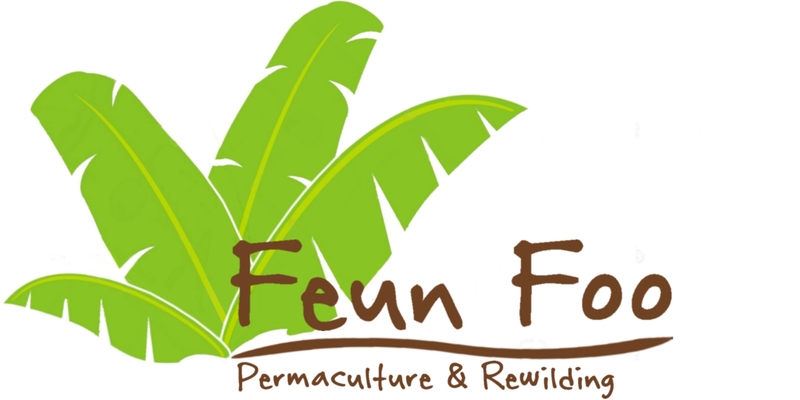 Feun Foo Permaculture&Rewilding is creating stable permacultural ecosystems. We are a small permaculture project in the south of Thailand that has been working on rewilding (re-naturalizing) a palm oil plantation and slowly transforming it into a food jungle. 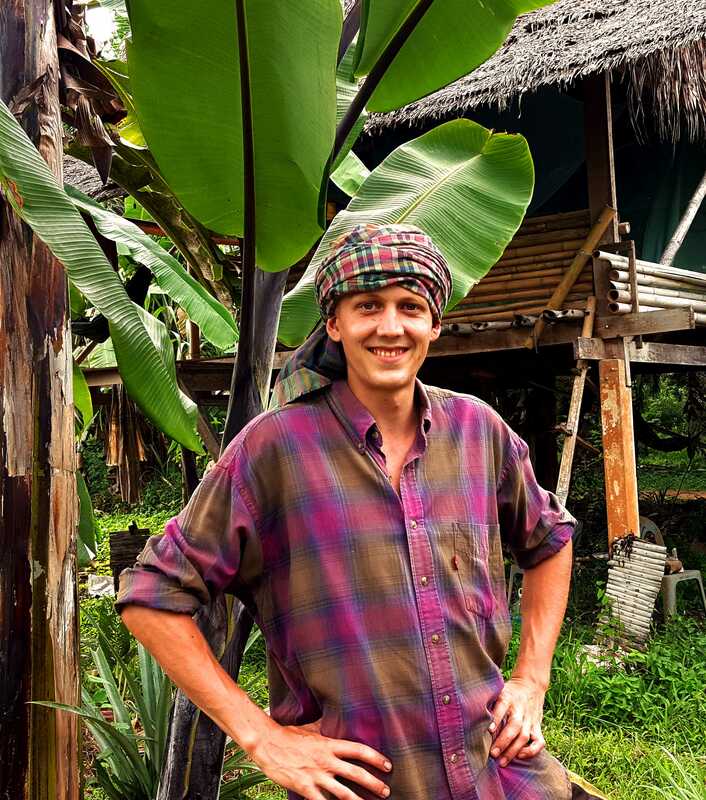 Dave (24) is a German who started to live on the farm in the beginning of 2014 as a volunteer. He finished school and afterwards worked for a year before deciding that the high levels of alienation, the stress and the listlessness among many of his European peers are not compatible with his expectations for a good life - so he decided to move to the tropics and provide himself with what he needs all by himself. When the owner, Tee, decided to start a new project in Ratchaburi (Numthang.org), Dave took over the farm. Karn (23) is from the rural area of the Northeast of the country and just got her bachelor's degree and worked for half a year for a hotel and then a real estate agency in Phuket before she decided that the normal life in the city isn't as wholesome and regarding as the simple life in Nature. She has a lot of experience with the simple life and enjoys it a lot - it is like reliving childhood memories for her. She makes herbal remedies and cosmetics from the plants in our garden and has impressive knowledge of uses and benefits of plants. We restore Nature to original beauty by converting a palm oil plantation into a food jungle. We revive an ancient, long forgotten way of life, so that it may lead us into a better, not only sustainable, but regenerative future. We provide one of many paths to live a happy and healthy life in harmony with Nature. Our mission is to become fully autonomous and develop a regenerative way of living. We do that mainly through practicing permaculture, but include elements of rewilding and primitivist philosophy and spirituality. We believe human beings are an inseparable part of Nature, one species in an enormous interconnected web of living beings that depend on and benefit from each other. We heal our landbase (which was previously devastated by years of oil palm monoculture) and plant all kinds of different fruit and vegetables on half a hectare of land. 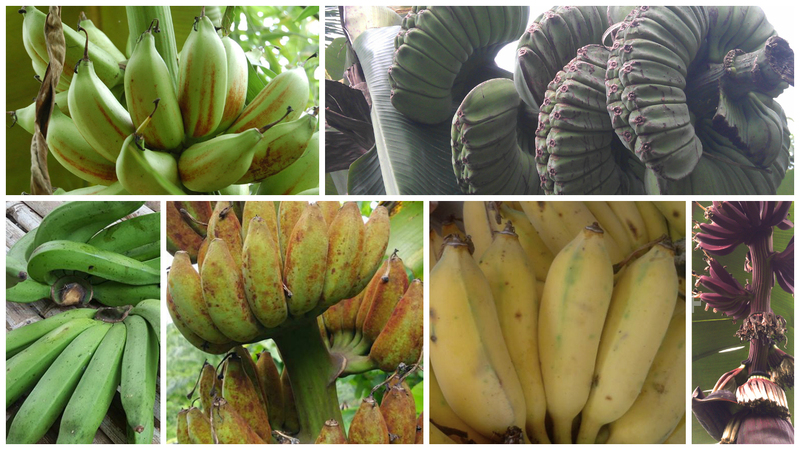 Our focus is on collecting rare banana trees, and so far we’ve collected over 50 different kinds. We offer anyone who is interested the opportunity to stay with us on our farm or to be a volunteer and take permaculture introduction courses that include tropical horticulture, growing organic vegetables and trees, primitive skills, sustainable building methods and many other topics. Additional information is found on our website at feunfoo.org; more pictures of our beautiful garden are occasionally uploaded to Instagram. Rewilding (ecological restauration) is about resisting the urge to control Nature and allowing it to find its own way. Because of the environmental destruction we humans caused during the last 10,000 years, we don’t think sustainability is enough – we have to heal, to restore our environment, our actions have to be increasingly regenerative. We are trying to create a regenerative lifestyle that heals the Earth - as opposed to the high-tech consumerist lifestyle in industrialized nations. But we are not "against the system" in a conventional way. We like and appreciate many features of civilization, but that doesn't change the fact that civilized life is a very destructive and wasteful way to live.There is no one right way for people to live, but we believe there should be alternatives that are less destructive. The Earth can support some people living in a destructive and wasteful way, she just can't support all 7.5 billion of us living like that. If the world population continues to grow, all the problems we have right now are going to get even worse. Industrial agriculture devastates the planet, deforestation and topsoil erosion are among the biggest problems that we create with monoculture farming. Permaculture creates topsoil and grows a variety of plants on them that fix the soil with their roots. Permaculture creates forests - and trees store atmospheric CO2 in the soil. Permacultural methods like adding biochar to the soil can actively fix vast amounts of CO2 in the soil, hence mitigating climate change. Industrial agriculture depends heavily on fossil fuels and other resources (to build the machines they use) which might soon get very sparse. Permaculture does not require fossil fuels, since it prefers hands and simple tools over big machines. Without a doubt, climate change will be the biggest challenge for our generation and the whole 21st century. We are the ones that have to change the vast majority of global civilization to become much less destructive. The general public slowly wakes up to the fact that we have to act now to avert the worst. 192 nations came together for the Paris Agreement in 2016, so the consensus is that radical change needs to happen fast. But it is still not clear what the individual can do. Common approaches are to get a solar panel, recycle, take shorter showers, buy local food, ride a bicycle, but nothing seems to be quite enough to really make a change. Especially people in western countries who live in big cities and have a regular job often want to help but don’t really know how. There are, in fact, many things you can do: you could start your own permaculture project and heal your landbase – or you could support little permaculture projects and urban gardens that sprout up all over the world. All of those projects do their best to heal Nature, plant trees, supply their immediate surroundings with surplus organic food, and – most importantly – are an example for others. All of those projects show that a different lifestyle is not only possible – but quite pleasant. They show that there is an alternative to techno-industrial consumer-capitalism, that there are many ways to live that are sustainable, if not regenerative – exactly what we need in this time of global crisis. Creating an alternative is fun - if it wasn’t for the fact that most projects lack financial means (especially in the beginning phase), because they are not oriented toward making profit (making more than you need) but toward being sustainable (making just enough for you and the people around you). This is why we say that if you want to help making a change but don’t really have the time or the opportunity, you can still help projects that do what you would like to support. Patreon is an excellent way to support little permaculture projects like ours. Rather than giving a one-time boost (like regular crowdfunding), it allows steady support - which is often desperately needed. Since we have no ultimate goal to work toward and our project has no end point, steady support helps us in the most efficient way. We still have to cover the costs for internet, electricity and gas, so most of the money we earn right now is used just to cover the few ‘civilized’ necessities. Our garden used to be a palm oil plantation, so we will invest big parts of the donations in organic material such as cow manure, which the most diligent members of our community - the earthworms - will convert into highly potent organic fertilizer. Since we are still not fully self-sufficient, we also have to buy some additional food for us and the visitors of our community. More things we’d like to do with your help is repairing and maintaining our buildings, buying new fruit trees and rare bananas, replacing the old fridge with a new more energy efficient one, and expand our free distribution literature and our farm library about sustainability and permaculture. We would like to share our knowledge and skills with as many people as possible. Right now the volunteers still have to pay a small fee (since we’re not yet self-sufficient) but for every patron we can reduce this fee, so that a broader audience can afford to receive a permacultural education and information on how a different lifestyle would look like – people who would like to volunteer often don’t have that much money themselves. We would like to support our friend Tee with his new project Numthang.org in Ratchaburi Province. We don’t need a lot of money, even a small donation is enough to make a big difference for us and the people around us. Our farm used to be a palm oil plantation, but we already cut down most of them so right now there are only 12 oil palms left. A palm oil plantation might be one of the most difficult places to start a permaculture project, since the palm trees deplete the soil of nutrients and their vast root network stays in the ground for years, making the soil hard and sticky. Our plan is to slowly replace the oil palms with fruit trees. We want to end our dependency on the few remaining palm trees on our farm, but so far we need every Baht/Dollar we can get for our project. If we find enough supporters we will cut down one palm tree (12 left) for each $30-step ($30 /$60 /$90 /… per month) and replace them with many different kinds of bananas. Bananas are an excellent staple food for humans living in the (sub-)tropics, they are easy to grow, useful, delicious and nutritious. They can be eaten raw, cooked, fried, mashed or added to a big variety of meals. The tree can be used for making rope, as chicken food, as fertilizer, the inside trunk and the flower are edible, it grows fast, improves the soil and gives fruit within about one year. They are drought-resistant and disease and pests are not common, so they don't require chemicals. Red, black, green or yellow bananas, big or small bananas, soft or chewy bananas, sweet, bitter or sour bananas, the variety seems endless. Sadly, the variety of bananas is steadily decreasing because only the few "best" varieties are grown and less profitable banana trees are being cut down. We make sure they survive! And, last but not least: Thank you! If you made it to this point, we thank you for taking interest in our project and our efforts to make a difference. If you choose to support us, we will express our gratitude personally and in written form. We know that a few dollars might not look like much, but to us every single dollar counts, and we promise to make sure the money finds a good use for a good cause. You are all the small plants that keep the soil from washing away. You hold together anything, and without you the earth would look like a lifeless desert. Among you are the pioneers (commonly called weeds) that improve the soil; decomposing and slowly building a layer of nutritious topsoil, you prepare it for all the other plants yet to come. One dollar might be not much when looked at as an individual act. But it means the world to us, and one dollar are roughly 35 Baht – the price of one kilo of rice, one bag of cow dung, or one 1 m-long roof tile made from nipa palm. They say ‘little strokes fell big oaks’, and it is true - even though that’s the opposite of what we’re doing. Everyone who helps us will receive a letter with a personal acknowledgement from our farm! You are the grass. You are an important part of the ecosystem, your roots hold the soil together, and your leaves shield it from heavy rain. There is many of you, and together you form a green ocean of simple beauty. Often underestimated, yet valuable and vital, the grass invites a great number of animals to help improve the landbase. Two dollars more or, in this case, less might make no significant difference on your monthly paycheck – but to us it is a huge boost, both morally and financially. You are the herb. Though sometimes almost indistinguishable from the grass, you stand out a little more. You have a special significance since your benefits and uses are manifold and you heal the ones that in turn help to keep you safe. Three dollars are quite healthy for us in a financial way, which in turn enables us to help our landbase becoming healthier. While costing you less than one gallon of fuel per month, your financial choice will actively help improving the environment in a twofold way: you use one gallon of gasoline less, and we plant more trees and help them grow to fix even more CO2. You are the shrub. You give us flowers, berries, young leaves – all those little delicacies that make life better. Bees and butterflies are common visitors, and they appreciate, like us, your gifts and contributions. Four Dollars are a delightful additive to our financial situation. It is a gift that comes from the heart, and we are sure we’ll find a good use for your donation, giving back some delicacies to Nature. You are the bush. You nurture us and give us a great number of foods. Birds love you, and so do we: gorgeous in appearance and selfless in acting, you are a welcome member of the community of life. Five dollars more make a stable part of income. They provide structure for further efforts to heal the environment and spread the word. You are the banana tree. You have a special place in our hearts in the hearts of various other animals that benefit from your existence. You are uniquely beautiful and unlike any other tree – since you are, botanically speaking, actually a very big grass. Seven dollars per month mean you already have a big impact on the well-being of our project. Like the bananas, you help us getting through the day - with a big smile on our face. You are the tree. You spend shadow, you provide us with sweet fruit and nutritious nuts, you altruistically give more than you take. We breathe your oxygen, you purify water and soil, and gift us with building material. Ten dollars are already quite a bit of money here in Thailand. For someone living in a western country with a regular income it might still not be a too painful loss; if you give selfless, we take grateful. Everyone pledging ten dollars will receive a special surprise from our garden! You are a big tree whose importance for the ecosystem is considered fundamental for its stability. You are a solid cornerstone of a stable and sustainable environment; even though there is not many of you. You help all species around you, plants and animals alike, with your generosity. 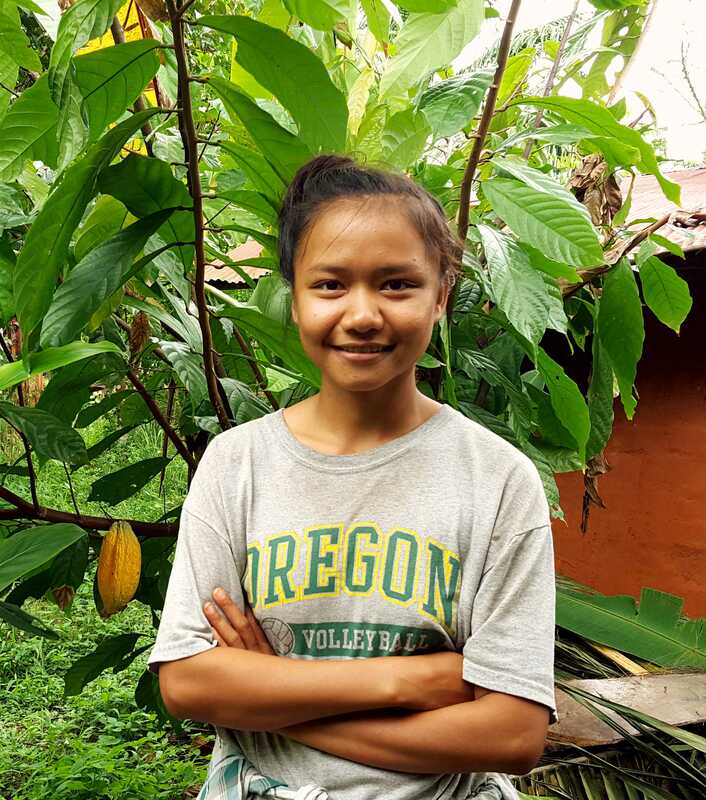 Anyone who is able to pledge $20 every month for our little project has a special place on our farm: we will plant a banana tree that bears your name on a little sign – and send you a photo. If you make it to Thailand in time, we will of course share the fruit with you. You are the vast network of mycorrhizal fungi connecting the plants, exchanging nutrients and information, and holding the strings in the background. The formation of a wholesome ecosystem is impossible without you. Pledging forty dollars per month is nothing less than incredible - like the mycorrhizal plant internet. And like them, you are almost invisible, but bring enormous benefit to the community. You let everything flow smooth. Every month your contribution allows one volunteer to stay on our farm for free! And if you ever happen to visit us, your stay will of course be free of charges, too. When we reach this goal, our monthly costs for additional food are covered, ensuring that we can provide us and our guests a diverse, healthy and delicious diet. We want to end our dependency on the palm oil industry, so for every $30-step in our monthly income we will cut down one of the remaining oil palms to make room for fruit trees and other beauties. Of course there will be a video of us cutting down the tree uploaded on our homepage for everyone to watch - seeing an oil palm fall is quite satisfying.